During the financial crisis numerous European governments decided to rescue domestic banks with public funds to prevent a collapse of the banking system. To internalize the public costs, bank levies have been introduced in many countries. This paper analyzes the German bank levy which was implemented from 2011 till 2014 and its effect on lending rates of regional banks. I examine not only if banks shift the cost of the levy to their customers' lending rates, but also whether there are spillovers to their local competitors. The German savings and cooperative banks are a perfect setting to study such effects as they only operate within well-defined regions, allowing us to identify their local competitors. Additionally, only some of them are subject to the levy due to a tax allowance. Further, with a market share of 42.8% in total, they are relevant. Firstly, we find that a bank that has to pay the bank levy raises its lending rate by about 0.14 percentage points. Secondly, we examine whether the increased lending rates of paying banks spill over to their local competitors. We find this indirect effect to be about one third of the size. Given an average lending rate of 4.96%, these effects are economically significant. Lastly, adverse effects of the levy on paying banks' loan supply growth are absorbed by their competitors to a certain extent. Ulrich Haskamp is currently working at the University of Duisburg-Essen as a research assistant of Prof. Ansgar Belke and is finalising his PhD at the Ruhr Graduate School in Economics. His research papers are focused on regional banking and financial market forecasting. He published in journals as Empirica, Economic Modelling and Frontiers in Finance and Economics and held presentations at international academic conferences and the European Central Bank. Previously, he worked for the EU FinMaP project and the ifo Institute. He studied in Osnabrück, Hull and Kiel. 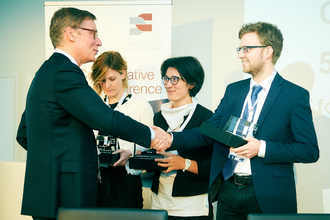 Ulrich HASKAMP won the 2nd prize at the EACB Award for young researchers on Co-operative Banks 2017. He received his prize at the occasion of the 7th Convention on Co-operative Banks on the 28th March 2017 in Brussels.